First American Printing & Direct Mail, Inc.
All benefits offered by the Tribe are not extended to all employees. Please refer to the below information for each benefit to determine if you are eligible. Regular full time and part time (working at least 16 hours per week) employees for 2019 have the option of 15 different choices. Please read the information carefully to determine what plan best fits your needs. Your FEHB enrollment will be effective the 1st of the month after your date of hire, unless otherwise specified. Please refer to the Risk Management office for the specific rate information: 601-663-1579. Also, the Tribal FEHB handbook for Indian Tribal Governments is located on this website. Please review this handbook for full details of the FEHB program. MBCI does participate in premium conversion. The plan you elect cannot be changed or canceled throughout the year unless you have a Qualifying Life Event (QLE) such as birth, death, marriage, divorce, adoption or loss of other coverage). If you do have a QLE, please notify the benefits office no later than 60 days after the event. Please refer to the FEHB handbook version dated 07/26/13 for full details. Dental insurance is effective the first of the month following your date of hire. Regular full time and part time employees are eligible. Benefits include preventative and restorative care. A $50 Annual deductible applies for restorative procedures per member. Annual limits are $1,000 per member under the Traditional and $2,000 per member under the Enhanced plan. An additional $1,000 and $2,000 one-time benefit could be accessed for dependents under 26 years of age for Orthodontia. Please refer to the Risk Management office for full plan rules, details and rate information on the Traditional and Enhanced Dental options. Dental coverage cannot be canceled or changed during the year unless you have a QLE (qualifying life event), such as birth, death, marriage, divorce, adoption or loss of other coverage) see the benefits office for complete details. If you do have a QLE the change must be made within 60 days. Benefits: An employee is eligible to participate in the Vision Insurance after 90-daysprobationary period.All regular full time and part time employees are eligible to receive this benefit. This is a primary vision care benefit and is intended to cover only eye examinations and corrective eyewear. Medical or surgical treatment of eye disease or injury is not provided under this plan. Plan features include frame benefit, eyeglass lens benefit, and contact lens benefit. There�s a $10 co-pay for eye exams and $25 co-pay for materials. Benefits: All regular full time and part time employees are eligible to receive a Life and Accidental Death & Dismemberment Insurance policy of $100,000. This is a term life policy; it does not accumulate any cash value. Your benefits could double if death results from an accident. At age 70, your amounts of life insurance and accidental death and dismemberment benefits will be reduced by 50%. This policy will be effective on the first day of the month following the completion of the employee�s 90-day probationary period. This life insurance has a conversion option upon termination. All premiums are fees associated are determined by UNUM. Benefits: This short-term disability policy will provide the regular full time and regular part time employee with disability payments for a maximum of 6 months per sickness or accident. The weekly benefit is $150.00 less taxes (net pay $138.52). The employee must be medically disabled from working their full schedule, under a physician�s care and off work to file a disability claim. A one-week waiting period is required to be served on all illnesses; however, no waiting period is required on an accident disability claim. This benefit is only for non-work-related illness or injury. On a routine normal pregnancy and delivery, the maximum benefits paid up to six weeks. This policy will be effective on the first day of the month following the completion of the employee�s 90-day probationary period. Premiums:	The employer will pay for a $500 per month benefit for each employee. The employee can elect an optional buy up of 60 % of their annual salary. Benefits:	This long-term disability policy will provide the regular full time and part time employee with an amount of $500.00 per month. This policy will be effective on the first day of the month following the completion of the employee�s 90-day probationary period. The employee must be completely disabled for a period of 6 months before a claim can be filed. This maximum benefit is payable for a period of five years or age 65 or whichever is greater. Benefits will be coordinated with Social Security benefits. Additional coverage may be purchased up to 60% of the employee�s annual salary. The additional premium will be payroll deducted bi-monthly. Supplemental benefits such as life, accident, disability, cancer, critical illness are optional. An enrollment for participation in supplemental benefits will be offered annually. Enrollment normally takes place in the Spring, Annually- effective October 1. An employee is eligible to make Elective Contributions as of the first quarter following the date of hire and the attainment of age 18. An employee will be eligible for the Employer-Matching and non-matching contributions, if any, as of the first of the quarter following the completion of one Year of Service, in which you worked 1,000 hours or more, and the attainment of age 18. **Employees have the opportunity to enroll/make changes in the plan each quarter. A notice will be distributed via e-mail, as well as through your supervisor, noting the deadlines for enrollments, changes, etc. The employee may contribute from 1% to 25% of their gross pay up to an annual maximum, currently $19,000 for 2019 before Federal and State taxes withheld. The Mississippi Band of Choctaw Indians will match the employee�s contribution up to 8%. If the employee chooses not to contribute to their retirement account (and you are not a highly compensated employee), MBCI will contribute 3% of your gross pay to your account. To receive this 3% benefit the employee must complete an enrollment form. For employees who are 50 and older would be eligible for catch up contributions if elected, with a maximum contribution for catch-up for 2019 at $6,000.00. Employees who elect the catch-up option must complete a new enrollment form each year. Anyone interested in Deferred Compensation can contact the Finance Office (ext. 1622 or 7445). 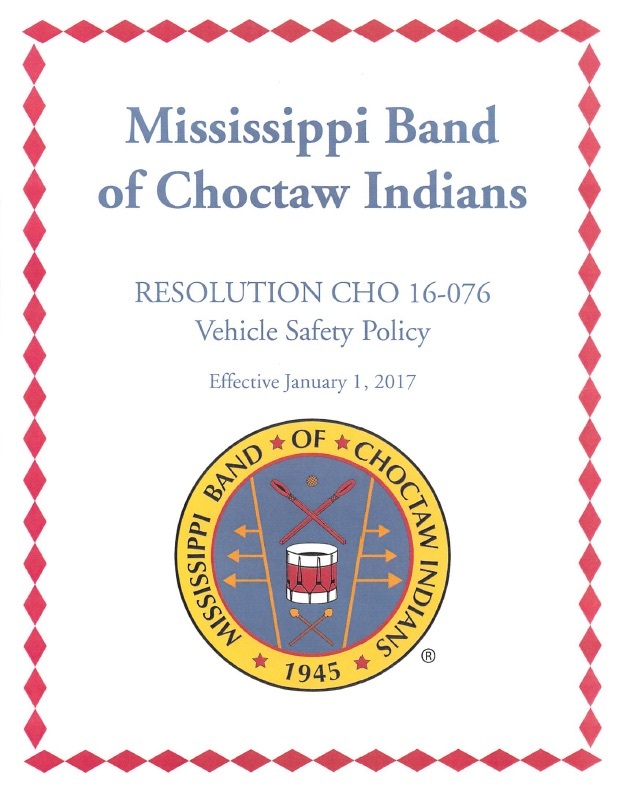 The Mississippi Band of Choctaw Indians follows the rules of the Mississippi Workers� Compensation Commission. It is your responsibility to report any injury received on the job, regardless of how minor, to your supervisor immediately. Ask your supervisor to document the details of the accident completely on the Supervisor�s Accident Report and First Report of Injury forms and to contact the Risk Management / Insurance office immediately. Be a careful worker and develop good work habits. Report any unsafe condition to your supervisor. Any employee who is to drive a tribal vehicle at any time must read and understand the Vehicle Safety Policy adopted by Tribal Council Resolution CHO-16-076 effective January 1 2017. This policy replaces the policy adopted by Tribal Council Resolution CHO-167-93 (1992) The employee must complete the required forms in this policy and be approved to drive a Motor Vehicle before operating a tribally owned vehicle or also in the event a personal vehicle is used for tribal business. Payroll Deductions: Employees of MBCI Tribal Government are responsible for the payment of the premiums for FEHB dependent coverage and any other benefit that is payroll deducted to include the supplemental insurance deductions while on leaves of absence. Your failure to submit the monthly premium or amount owed in a timely manner will result in loss of coverage. If you need assistance please contact our staff at the numbers below.